Borroughs High Density Drawers provide a powerful storage solution with a capacity of up to 400 lbs per drawer. Partition and divider combinations allow you to design a system with pre-configured or customized layouts to improve space efficiency as well as organizational productivity of heavy, hard to store or smaller items. Drawers are designed to protect inventory with a cushion impact closing mechanism and a closing action that won’t allow drawers to drift open. Optional label holders provide easy and fast compartment identification to improve retrieval time and efficiency. 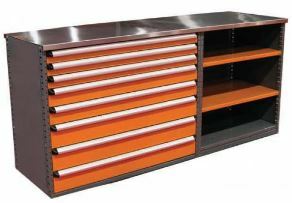 Best of all, Borroughs High Density Drawers are designed to work easily and seamlessly with your Box Edge Plus® steel storage systems. Partitions and dividers combine for an almost endless variety of storage spaces to match stored items. Drawers have 5 different heights: 3″, 4 1/2″, 6″, 9″, and 12″. Drawers can be arranged and rearranged to keep your storage system efficient as your operation grows and changes. They can be installed in any combination as long as the total height of the drawer fronts does not exceed the height of the mounting uprights. Drawer fronts are flush with posts for a custom look. 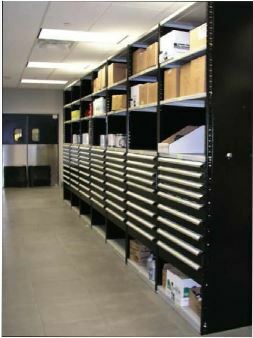 Slotted steel partitions create major drawer interior storage spaces. Partitions slide into slots on drawer walls to span the full width or depth of drawers, and allow the addition of dividers to further subdivide the drawer’s interior. Partitions are available in 18″ and 24″ depths; 36″ and 48″ widths, and 3″, 4 1/2″, and 6″ heights. All partitions are painted #161 Mist Gray. Galvanized steel dividers subdivide the storage spaces between partitions and drawer walls. Dividers simply drop into slots in the partitions and drawer walls making storage space adjustments quick and easy. Slots are manufactured in partitions and drawer walls on 1″ normal centers. 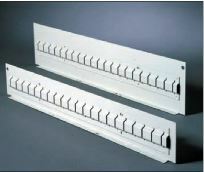 Divider widths are measured by the number of drawer wall slots the divider spans (i.e. a 3S divider will span 3 slots). 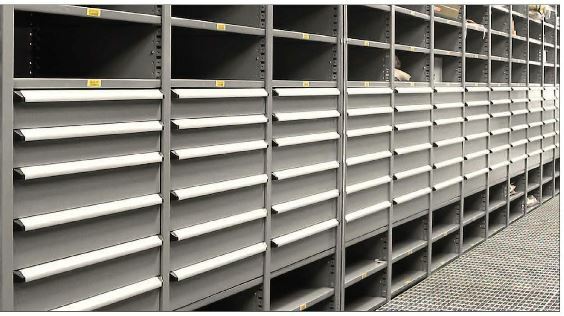 Dividers are available in heights to match partitions (3″, 4 1/2″, and 6″)and in 11 widths (3 slots through 13 slots). 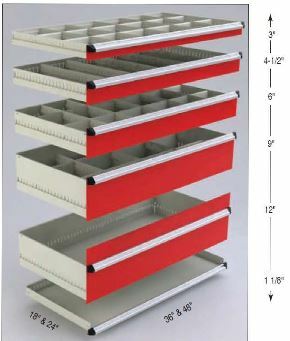 the 36″ wide drawer has 31 slots allowing for up to 10 3s storage spaces. The 48″ wide drawer has 43 slots, allowing up to fourteen 3s storage spaces. Full-width aluminum handle features integral label holder, paper insert, non-reflective Mylar cover and plastic end cap. 400 lb capacity slides offer a smooth suspension with full drawer extension. Mounting upright sets are available in 4 heights: 18″, 24″, 36″, and 48″. They attach easily to angled or beaded shelving posts. Optional snap-on gray plastic label holders are available for additional parts identification within drawer compartments. Please contact us and one of our representatives will help you design a system to satisfy your storage requirements. Deluxe Systems will provide the design, the equipment, and the installation.